The huge conflicts between the worldwide energy crisis and China energy demand and supply, caught the unprecedented attention to the energy conservation, especially the construction industry which take one third of the overall energy consumption. Along with the people’s mentality increases on energy saving, and curtain wall usage on architectures in big volume, these all compelled the Insulated Glazing development trends toward Low-E coated IG even gas filling whilst include triple glazing. The code EnEv2009 (even EnEv2012) in Germany made a very high requirement on insulation of architectural curtain wall. According the Europeans projects that SYP had worked on, most of the projects require IG must have 16mm spacers, Argon gas filling and double Low-E coatings as only with such kind of configuration that may be complied with the U value specified by the German Code. 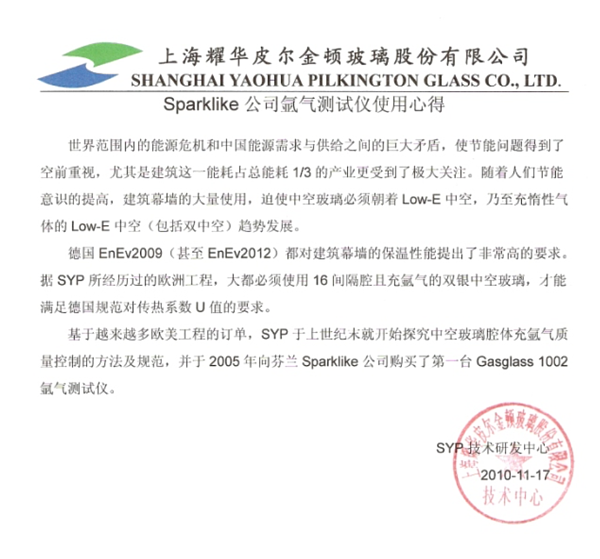 Base on the more and more project orders from Europe and Americas, SYP started the study on how to gas fill, quality control of gas filling and tech specification since the end of 20th century whilst acquired the first Gasglass 1002 from Sparklike in 2005. 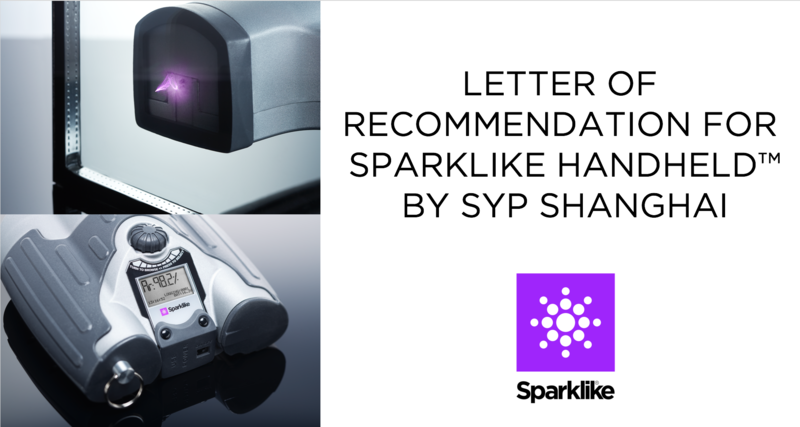 After many tests on the specimens, and applied Sparklike technology to the quality monitoring during the production process enabled us to accumulate significant argon test experience, and allowed us to recognize the importance that Sparklike equipment can bring to the production process. As the one and only noninvasive test method for argon gas concentration measurement in IG, it is definitely an innovation. It is not like gas chromatography or other oxygen test methods, which requires destroy the IG construction itself, and the IG cannot be used any more. To use Sparklike test analyzer, it do not need to destroy the IG structure and at the same you may get the accurate argon gas concentration figure. Easy to use. Such device does not limit the usage environment in laboratory only, on thecontrary, due to the easy use, only require simple training and technique demonstration, the inspector on production line may pick up easily. The second generation Sparklike Handheld analyzer is mobile with free movements which enable you to monitor at any time, hence it is the best partner of production line for argon gas concentration control. The equipment maintenance is easy. With the correct operation including simple maintenance measures the analyzer may stay stable for a long term. The annual Sparklike CARE provided by Sparklike is kind of safety warranty for the users. 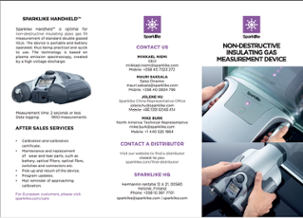 According to the above mentioned advantages of Sparklike device, all our subsidiaries acquired 4 Sparklike Handheld™ respectively in years 2007, 2008 and 2009 whilst been successfully applied to different IG lines for stable use, exert its great function at quality control. To keep reading why there's no need to break the insulating glass unit in order to conduct insulating glass unit's argon fill analysis, click this link.